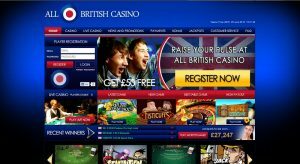 All British Casino - 100% bonus up to £100 + 100 free spins! For Brits who want a online Casino that they can call their very own then they can turn to the All British Casino for this. This Casino was established in 2013 and immediately upon visiting the Casino site one can see that it is full of excitement and adventure. Not to mention the opportunity of winning some very substantial money. It has everything that one would expect in a top quality Casino and has something for everyone when it comes to great online Casino entertainment pleasure. The All British Casino has the full casino lineup which includes a grand selection of slots as well as some great video slots. For table game players, there is lots to choose from and for those that are into wanting what a live casino can bring, then the all British Casino can certainly provide this. Video poker is a another selection that is being offered and for a change of pace this Casino also offers Keno. The Live Casino for those that are enthusiastic for this type of game play consists of Roulette and Blackjack. While many of the online Casinos choose to go with multiple software providers for their game play the All British Casino has chosen to focus mostly on the NetEnt Casino software provider. There is certainly nothing wrong with this as NetEnt has a great reputation for offering a great selection of Casino games with pure crisp graphics and great soundtracks. By using the NetEnt software the Casino is able to offer some very lucrative Jackpots on the local platform which includes the Bonus Keno Jackpot, Geisha Wonders Jackpot, Mega Joker Jackpot, and these are just to name a few. In addition to this, there are the pooled Jackpots which are Hall of Gods Jackpot, Mega Fortune Jackpot and the Arabian Nights Jackpot. What makes the All British Casino truly geared for the British public is that their welcome bonus is restricted to those that are living in the United Kingdom. This bonus requires a minimum deposit of 20 £ and the bonus consists of 100% welcome bonus + 100 free spins. The free spins are restricted to the slots comprised of the Starburst, Pyramid or Aloha. Although the welcome bonus is restricted to the British the site itself does except players from several other countries. While this is what the All British Casino site reiterates, there are some rumblings on the Internet that the All British Casino has decided to open its welcome bonus up to all of their players that have been excepted by the site. The mobile version of the All British Casino is offered through the App for the All British Casino. Casino gamers can take advantage of over 20 games provided through the NetEnt software platforms. Although there is a minimum deposit to be able to take advantage of the Welcome bonus the minimum deposit otherwise is 10 £. This casino offers the most common forms of deposit methods which are MasterCard, Netteller, Paysafecard, Skrill, Ukash, Visa, Visa Debit, and Visa Electron. When it comes to withdrawals the minimum that can be withdrawn is 20 £ and this Casino is well known for its speedy withdrawal transactions where they will try and process them within a 24 hour period. However, the transfer time can vary. The All British Casino takes a lot of pride in making themselves available through their customer support. They can be reached through their email or their telephone, and they have live chat available as well. All of these the channels allow for 24/7 access.